When The Imitation Game (2014, dir. 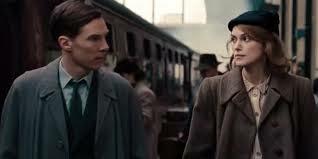 Morten Tyldum, based on Alan Turing: The Enigma by Andrew Hodges) came out, it got some early Oscar buzz and in fact earned nominations for best picture, best director, best actor (Benedict Cumberbatch), best supporting actress (Keira Knightly), and four others. The film seeks to help the general public gain a better understanding of Alan Turing’s contributions to modern society. It is also arousing complaints about its historical accuracy. So let’s take a look at it. Spoiler Alert: If you are planning to see this film in the theater, you may want to put off reading this post, although if you know much about Turing’s life, there aren’t really many surprises in the film. Alan Turing was a ground-breaking British mathematician and cryptanalyst who laid the foundations for much of modern computer science. Of particular importance was his work at Bletchley Park in England during World War II. He and a small staff of other cryptanalysts worked in Hut 8, which was dedicated to finding ways to break German naval ciphers, most importantly the famous Enigma machine. To accomplish this, they built a proto-computer that could process cipher combinations far faster than humans possibly could. Their success was a major strategic breakthrough for the British and is widely credited with hastening Germany’s defeat and, as the film claims, saving the lives of perhaps 14 million British (although how that number was calculated I have no idea). Turing’s contributions to computer science were not limited to cracking Enigma. He helped develop the earliest stored-program computers and began to explore the question of whether machines might someday be able to think. He posed the famous Turing Test (also sometimes called the Imitation Game, hence the title of the film, but yes, I know that the Standard Turing test is not quite the same thing as the Imitation Game), which is a test to see whether a computer can exhibit behavior indistinguishable from a human being. Turing is sometimes called the father of modern computing. Given that you’re reading this blog on a computer, you’re benefitting from Turing’s major contributions to modern life. Turing was a rather eccentric figure; he was messy and shy, and by modern standards something of a geek. At Hut 8, he tied his mug to a radiator so that his co-workers couldn’t use it, and he sometimes wore a gas mask to help him deal with his hay fever. He was also extremely athletic. At age 10, he bicycled 60 miles to get to his new boarding school during a rail strike. He was an ultra-distance runner of near Olympic quality; he occasionally ran the 40 miles from Cambridge to London for important meetings. 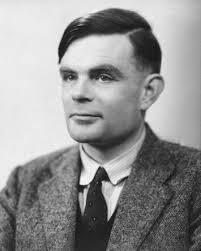 Unfortunately for Turing, he was also a homosexual at a time when homosexuality was a criminal offense in Britain. In 1952, a 19-year-old lover of his helped a friend burgle Turing’s home. Turing reported the burglary and as the facts came out, ultimately confessed his homosexuality to the police. To avoid a prison sentence, he agreed to undergo chemical castration, done with estrogen injections that caused him to develop gynaecomasty and impotence. In 1954, after a year of injections, his housekeeper found him dead. 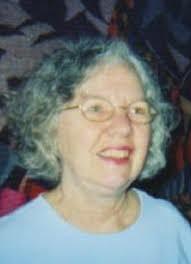 An autopsy concluded that the cause of death was cyanide poisoning. A half-eaten apple was found near the body, and an inquest determined that he had committed suicide, possibly by injecting the apple with cyanide and eating it. (That half-eaten apple, incidentally, has been cited as the inspiration for Apple Computer’s famous logo, although Steve Jobs denied it.) Questions remain about whether Turing might have accidentally been poisoned by cyanide fumes from a gold electroplating system he had set up in his bedroom, but his biographer Andrew Hodges has suggested that Turing chose a deliberately ambiguous death to spare his mother’s feelings. The film opens in 1951, with the police showing up to investigate the burglary at Turing’s home. He gets brought in for questioning and Turing’s explanation of his work triggers a flashback that forms most of the film. Interspersed with his time in Hut 8 we get scenes of a police detective trying to figure out what secret Turing is hiding. The film also periodically jumps back to Turing’s years at the Sherborne School growing up. The film does a good job dramatizing the work done in Hut 8 to crack the Enigma machine’s system and explaining the nature of the problem that the cryptanalysists were dealing with. The performances are solid, and Cumberbatch does a good job with the material he’s given. Unfortunately, as biopics so frequently do, The Imitation Game takes significant liberties with the details of Turing’s time at Hut 8. The film essentially claims that Turing was the driving force behind the breakthrough that cracked Enigma, with everyone else resisting his ideas, except for Joan Clarke (Knightly). The viewer would be forgiven for assuming that Turing essentially cracked the Enigma system himself, with a little help from Clarke and another co-worker, Hugh Alexander (Matthew Goode). In reality, while Turing was undeniably a central figure at Hut 8, it was definitely a collaborative process, involving more than a dozen men and women. Turing would not have cracked Enigma on his own. In the film, Turing is initially thwarted by his co-workers, who are led by Alexander, and his uncomprehending commanding officer, Commander Denniston (Charles Dance); in desperation, he writes to Winston Churchill and gets Churchill to give him control of the whole project, demoting Alexander to a secondary position and frustrating Denniston, who spends the rest of the film seeking ways to shut down Turing’s project. The film seems to suggest that this all happened in 1941. Turing’s action alienates the rest of the staff, who must then be gradually won over again. We’ve all seen this narrative many times before; it’s the Christopher Columbus scenario, with Turing as the only man who understands the problem, Clarke as the faithful supporter who helps him along the way, and everyone else as blocking characters who must either be overcome or won over. 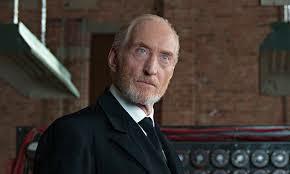 Charles Dance as Cdr. Denniston. In reality, Turing was one of the senior figures in charge of Hut 8 from the start. The obstacle he faced was not opposition from his colleagues and Denniston but rather a lack of resources. Turing, Alexander, and two other members of the project wrote to Churchill and got Churchill to allocate more resources to them. Turing left Hut 8 in 1942, at which point Alexander then took over leadership of the project. Another major problem is simply the film’s depiction of Alan Turing as a human being. Cumberbatch’s Turing is a man with high-functioning Asperger’s Syndrome, a man who is fascinated by numbers but has no idea how to relate to human beings and consequently alienates those around him. He doesn’t understand jokes, can’t dance, and is maddeningly literal. At one point, Clarke tells him that he needs to win their co-workers over, so Turing walks into Hut 8, hands everyone an apple, and proceeds to awkwardly tell a joke. He names the code-breaking machine ‘Christopher’, after a friend from the Sherborne School. The real Turing was shy and geeky, but he could also be warm and charming. He was noted for his sense of humor and his popularity with children. The code-breaking machine was called the ‘bombe’, not ‘Christopher’ and there’s no evidence that Turing personified it. Denniston, far from being an uncomprehending military officer, was in fact an experienced cryptanalyist in his own right. So the film gets most of the personalities involved wrong in key ways. Similarly, Joan Clarke’s history is misrepresented. In the film, she is recruited because she solves a crossword puzzle in a newspaper; the puzzle was a tool to find people with unidentified cryptanalysis skills. Although Turing did recruit some people that way, Clarke was not one of them. In reality, she had known Turing at Cambridge, and after she was hired at Bletchley as part of the stenographic pool, she was promoted on the basis of her mathematical skills, which were considerable. Her film parents want her to get married and try to force her to leave Bletchley to find a husband; this prompts Turing to propose to her as a way to keep her on the project. Here’s Clarke’s version of how the engagement happened. Both Graham Moore, the film’s screenwriter, and Knightly have insisted that they ought not be restricted by historical accuracy because they need creative license to produce their art. As Moore has said, “you don’t fact check Monet’s ‘Water Lilies’.” Let’s leave aside the fact that scholars do actually fact-check artwork all the time. One problem with Moore and Knightly’s argument is that what they’ve invented isn’t particularly creative. The film falls into standard Hollywood patterns and clichés. Turing, as I noted, is played as Christopher Columbus, the one man who understands something important and who has to overcome the ignorant opposition of those around him. If they want to be creative, that’s fine, but then they should actually show us things we haven’t seen before. Additionally, Moore has insisted that historical accuracy was incredibly important to him. That’s obviously not true; he’s made significant deviations from the facts in almost every part of the film; the last act, in which Turing is being blackmailed by a Soviet spy, is entirely invented, as is a scene in which Denniston literally unplugs Christopher. But even if Moore was trying to be extremely respectful of the facts, he’s trying to have it both ways. He’s insisting on historical accuracy as a selling point of his film and then demanding the right to not be historically accurate so he can be artistic. These are mutually exclusive goals. The historical Turing’s life wasn’t art and this movie isn’t really Turing’s life. If he wants the freedom to fabricate plot points and details for the film, then he has to admit what he’s doing is not a historical film, but historical fiction. Finally, Morton Tyldum insists that his historical liberties were about giving the audience a sense of who Turing really was as a person. “Our goal was to give you ‘What does Alan Turing feel like?…What does his story feel like? What’d it feel like to be Alan Turing? Can we create the experience of sort of ‘Alan Turing-ness’ for an audience based on his life?’” But ‘Alan Turing-ness’ is a lot like truthiness. It might give the audience an idea that they know who Turing was, but Cumberbatch’s semi-autistic Turing wasn’t the Turing his co-workers at Bletchley knew. Moore’s script leaves out Turing’s charm, the sweetness he showed while engaged to Clarke, and even many of his actual eccentricities. Ultimately the viewer emerges from the film knowing some facts about Turing, but knowing a lot of falsehoods about Turing that will probably make it harder for them to get a sense of the real man. If this film is playing the Imitation Game, it’s doing it quite poorly, because I was never fooled into thinking this film was Alan Turing’s life. Update: Cumberbatch and Stephen Fry have discussed the issue of Turing’s pardon and have some interesting things to say about it here. The Imitation Game is available on Amazon in a couple different formats. Turing has been the subject of a number of works. 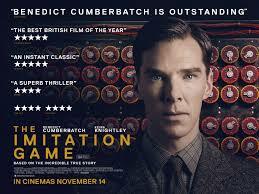 The film is based on Andrew Hodges’ Alan Turing: The Enigma: The Book That Inspired the Film “The Imitation Game”, which is probably the most highly-praised on them. Also worth a look is a biography written by his mother, Sara. Alan M. Turing: Centenary Edition was, as the title suggests, reissued for the centenary of his birth, and includes new material by his brother. 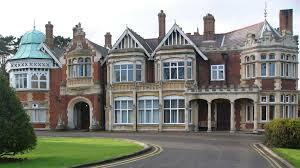 Bletchley Park, as I noted, was not a one-man show; Turing was part of a team of very talented men and women, most of whom get short shrift in the film. To help balance the film’s skewed take on Bletchley, consider reading The Secret Lives of Codebreakers: The Men and Women Who Cracked the Enigma Code at Bletchley Park. Thank you so much for this post! I knew some of Alan Turing’s life before seeing the movie. I am sad they got the collaborative part so wrong. I think part of the problem is that biopics naturally want to focus attention on the main character, which tends to de-emphasize the actions of others that don’t directly connect to the main character. Well, I think they could have made him less socially awkward too. It is an interesting contrast to Selma, which no doubt got stuff wrong, but got the collaborative stuff so right. I agree. Turing was shy, but he wasn’t autistic, and he was funny and charming much of the time. I’ve hesitated to review Selma because it’s pretty far out of my expertise. But I’ve read that the film’s depiction of LBJ is extremely poor, that he was far more committed to King’s goals than the film shows. They collaborated to some extent, and the film doesn’t want to show that.